Spring-loaded mechanical tool locates the exact distance from the center of the mill spindle to the edge of the work piece so you know precisely how deep you’re milling, without guessing. Easy-to-use—just insert in the mill collet, run at 500-1000 rpm, and move slowly to the edge you want to locate. 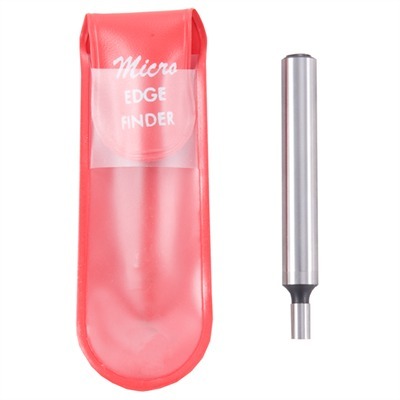 As the lower cylinder of the Edge Finder touches the work piece edge, it “kicks out” suddenly. When you see the kick, the spindle centerline is located exactly .100" from the edge of the work piece. SPECS: Steel, surface ground and hardened. 27⁄8" (7.3cm) OAL, 3⁄8" (9.5mm) diameter shank, .200" (5.1mm) diameter tip.